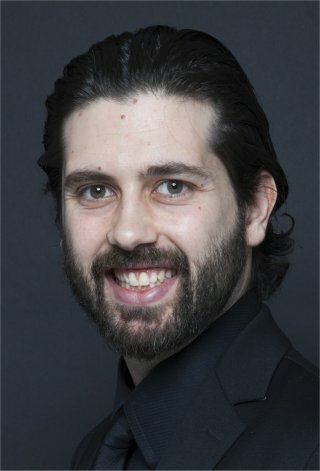 The current Musical Director of the Cantelli Orchestra is M° Alessandro Calcagnile. Conductor and Pianist, he devotes much of his energy to projects with modern and contemporary works and collaborated with some of the most important Italian living composers. He studied at Conservatory "G. Verdi", Milan, Conservatory "L. Marenzio", Brescia, Hochschule für Musik Nürnberg, Accademia Musicale Pescarese. He performed with many orchestras and ensembles including Orchestra "I Pomeriggi Musicali" of Milan, Orchestra Nuova Sinfonica Italiana, Orchestra Nuova Cameristica, Orchestra Toscana Classica, Orchestra da Camera d'Aosta, Bellagio Festival Orchestra, I Solisti Lombardi, New MADE Ensemble, Chamber Orchestra of Lugano (Switzerland), Philharmonic Orchestra "Mihail Jora" of Bacau (Romania), Accent Orchestra of Cincinnati University (USA), the State Academic Orchestra of St. Petersburg (Russia), Seoul Proart Orchestra (South Korea). He participated in many productions related to the film music, especially silent movies, conducting original symphonic scores (Pietro Mascagni, Luigi Mancinelli, Gottfried Huppertz and Charlie Chaplin) and new soundtracks. He carried out dozens of master classes and workshops, seminars and presentations in Italy (Conservatory of Milan, Conservatory of Turin, Conservatory of Venice, Museo del Novecento and Museo del Cinema of Milan, Fondazione Siotto of Cagliari) and South America (Buenos Aires, Santa Fe, Montevideo). As pianist and conductor he recorded CDs for various labels including Amadeus and Sconfinarte. Co-Founder and Board Member of Contemporary Music Center of Milan, Alessandro Calcagnile is the Artistic Director of Festival "Milano: 5 Giornate per la Nuova Musica", Principal Conductor of New MADE Ensemble and Orchestra I Solisti Lombardi, Principal Guest Conductor of Bellagio Festival Orchestra. Since summer 2014 he is the Musical Director of Cantelli Orchestra, Milan.